Bailey's Salmon has migrated upstream along the Mainstem of the Penobscot River, to the Eddington Salmon Club, just below the former site of Veazie Dam. The Veazie Dam was removed in 2013. In this view, Bailey and his salmon are on the club's porch. You can see Veazie powerhouse in the background. Are you excited about World Fish Migration Day? 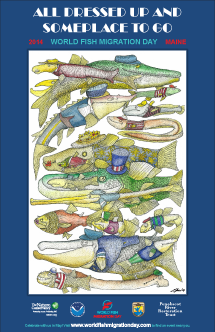 Share your enthusiasm with a fun poster illustrated by Maine artist and biologist Laury Zicari! Contact us if you do not have access to a large format printer and you are interested in a large poster for your group or classroom.